Australia’s climate has warmed since national temperature records began in 1910, with mean surface air temperature showing around a 1 °C warming since then (Figure ATM18). Concurrent with the warming trend in Australian land temperatures, temperatures in the oceans surrounding Australia have also continued to increase (Figure ATM19). The surrounding and neighbouring oceans play a highly influential role in the variability of Australia’s climate. Large-scale drivers in the Indian and Pacific oceans, such as ENSO (with El Niño and La Niña phases), affect our climate on a range of timescales. Warm temperature anomalies and record warmth have persisted in the Indian Ocean in the past decade. On a smaller scale, regions in Australia can also be affected by changes in sea surface temperatures in Australia’s immediate vicinity. Warming from the middle of the past century is most pronounced along the southern Australian coasts and the Tasman Sea, possibly associated with a southwards extension of the East Australian Current. The warming trend in mean temperatures has been accompanied by a large increase in extreme temperatures. The shift in mean temperature has seen fewer cold records broken and more warm records broken. Since 2001, the number of extreme heat records in Australia from station data has outnumbered extreme cool records by almost 3 to 1 for daytime maximum temperatures, and almost 5 to 1 for night-time minimum temperatures (Trewin & Vermont 2010, Trewin & Smalley 2013). Most notably, heatwaves have increased in frequency, duration and intensity in many parts of the country (Alexander et al. 2006, Alexander & Arblaster 2009, Perkins et al. 2012). Recent years have seen a number of significant heat records broken across the Australian continent. Heatwaves can have large impacts on human health, the severity of fire weather, and other biological and ecological systems (Box ATM3). The nature of the heatwaves is changing in many parts of Australia—they are becoming more frequent, more intense, of longer duration and over a larger area. Since SoE 2011, several widespread extreme heat records have been broken. The increase in mean temperatures since 1910 has also affected the frequency of warm months. Very warm monthly maximum temperatures were 5 times more likely to occur in 2001–2015 than in 1951–80. The frequency of very cool months declined by around one-third during the same period (CSIRO & BoM 2016). Australia’s warmest year on record was 2013, with summer 2012–13 the warmest on record and spring 2013 the warmest at the time. The spring record was broken the following year in 2014, and 2014 was the third warmest year on record. Spring in 2015 was the second warmest on record. 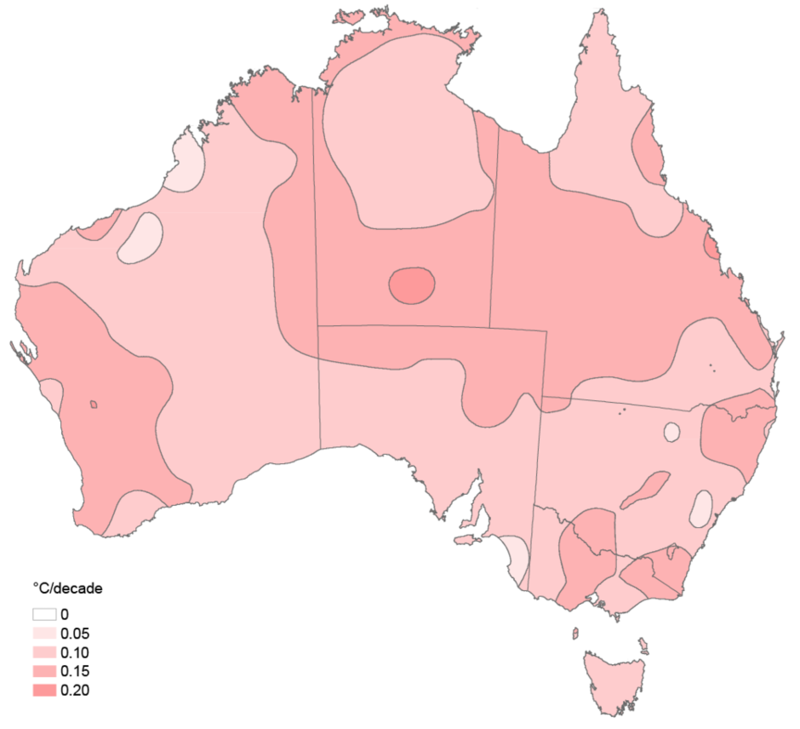 Summer 2012–13 was especially intense in terms of total heat, with Australia’s area-averaged hottest month, hottest week and hottest day on record, and the longest and most spatially extensive national heatwave on record (BoM 2013). The science can now partially attribute the likelihood, frequency, extent and severity of record heat events to increasing mean temperatures because of anthropogenic climate change. For example, the record-breaking temperatures experienced in Australia during 2013 are extremely unlikely to occur in a climate that does not include warming as a result of increased GHGs. Studies investigating fraction attributable risk from increasing GHGs have shown a 5-fold increase in the odds of extreme heat when comparing simulated climates with and without an enhanced greenhouse effect. For example, there is a 5-fold increase in the odds of experiencing the record hot Australian summer of 2012–13, when Australia experienced its hottest day, week and month on record (Lewis & Karoly 2013). The extreme anomalous heat experienced during the (at the time) record-breaking spring of 2013 was even less likely to have occurred without anthropogenic forcing. The enhanced greenhouse effect made the 2013 hot spring more than 50 times more likely to occur (Lewis & Karoly 2014) when compared with a pre-industrial climate. A study using a detailed modelling and statistical approach found that global warming likely contributed up to 15 per cent of the record September 2013 temperature anomaly (Arblaster et al. 2014). Likewise, the subsequent record-breaking spring of 2014—specifically the anomalously warm months of October and November—was in large part caused by circulation changes because of the upwards trend in oceanic temperatures in response to increased CO2 levels in the atmosphere across several years (Hope et al. 2015). However, to fully describe recent variations in Australia’s climate, it is necessary to consider the influence of both natural climate variability and anthropogenic global warming. The combined influence of natural and human drivers has had a significant impact on Australian weather and climate in recent decades. For example, instances of record-breaking temperatures that have occurred this century have typically resulted from periods of low rainfall combined with background warming. The La Niña year of 2011 was the first year with an annual mean temperature below average since 2001, mostly as a result of below average maximum temperatures associated with the widespread rainfall. Trewin B & Vermont H (2010). Changes in the frequency of record temperatures in Australia, 1957–2009. Australian Meteorological and Oceanographic Journal 60(2):113–119. Trewin B & Smalley R (2013). Changes in extreme temperatures in Australia, 1910 to 2011. In: 19th AMOS National Conference, Melbourne, 11–13 February 2013. Perkins SE, Alexander LV & Nairn JR (2012). Increasing frequency, intensity and duration of observed global heatwaves and warm spells. Geophysical Research Letters 39(20):L20714, doi:10.1029/2012GL053361. Lewis SC & Karoly DJ (2013). Anthropogenic contributions to Australia’s record summer temperatures of 2013. Geophysical Research Letters 40(14):3705–3709. Lewis SC & Karoly DJ (2014). The role of anthropogenic forcing in the record 2013 Australia-wide annual and spring temperatures. Bulletin of the American Meteorological Society 95(9):S31–S34.